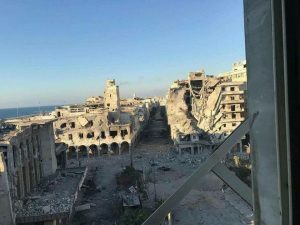 Five soldiers serving with the Libyan National Army (LNA) are reported to have been killed today in the current offensive in central Benghazi’s Suq Al-Hout area. Three were killed by mines and two were shot dead by snipers. At least two militants died, LNA sources say. The LNA’s air force started fresh strikes late last night. One local described it as relatively rare to see such an intense and “violent” bombardment which continued until this morning. In the early hours the LNA’s ground forces then moved on the militants but they made slow progress in house-to-house fighting. By this evening, however, army sources told the Libya Herald that the Wahda Bank main office and Misrata Street had now been liberated. As ever, though, the militants have been leaving behind improvised explosive devices and booby traps.